Happy 10th birthday in Heaven, Brenham! I miss you so much, and joyfully anticipate the day we are reunited at the feet of Jesus. Until then, I’ll live the rest of my days praising the One who has given us salvation and the promise of eternal life together in Heaven’s glory! 10 years ago, in the midst of deep, sudden loss I remember wondering what I did to deserve this suffering, I wondered if life would ever be good again. Through the ongoing process of grief, the tears that sometimes still fall, many prayers, and the healing that only God can give-I’ve come to a difference place, with a different outlook where I daily reflect on God’s faithfulness in my life and wonder what I did to deserve this goodness. All those tears brought me here. 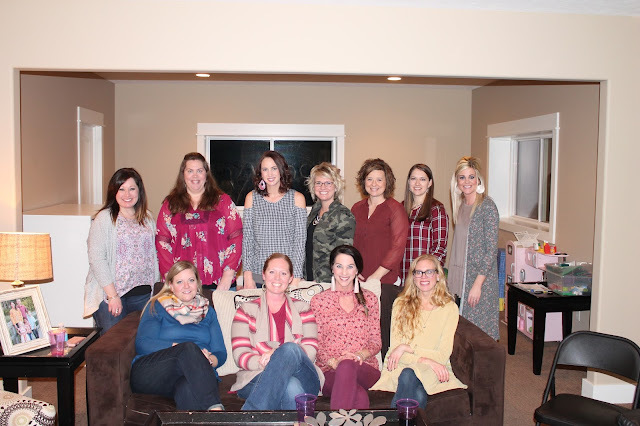 Last week I hosted the 7th Annual Favorite Things Party! As always, we had such a great night; awesome gifts, yummy food and great fellowship with some of my dearest friends! Everyone took 3 of the same of their favorite things for $10 or less along with an optional favorite appetizer or dessert. When it was time for the exchange everyone took turns to show their favorite thing that they brought, and explain to everyone why they like it. I then drew names one at a time out of a bowl, once your name was called it was your turn to go up and choose a favorite thing from the table. We did 3 rounds of that so each girl went home with 3 new favorite things! Trisha: Her favorite books--"If You Only Knew" "You Are Free" and "Uninvited"
Robb turned 34 on the January 22nd! We celebrated him with a date night out for dinner and to see The Greatest Showman. We also celebrated his and my sister Lisa's birthdays at FireRock Grille with my parents and the kids, and also with Robb's family at Carinos. Although I hate the cold, the snow is so pretty. After a nice long break it was back to the mat in January. Feels good to be back at it. Dr. Jovie's advice on staying healthy, "just eat good food and Jesus will heal you!" Gray spotted a rare visitor in our front yard! She was a little unsure at first but totally loved it! Trisha and I at Moxie Matters tour! Jen and Nichole were amazing! This guy was Star Student of the week! A big cup of fuel before getting to work on my sample sale. She got her mama's baking skills. I apologize in advance to her future husband and kids, but I fully endorse Zeeland Bakery for baked goods of any kind. visit to the Lake with Dad while Mom was at Woven. My bedroom door was flown open by a cute boy who should have been sleeping, this piece of paper was thrown in, and the door was quickly shut again followed by running footsteps back to his room. 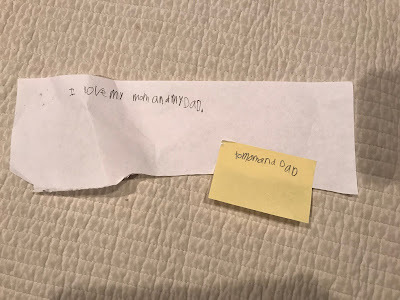 This sort of stuff isn’t the norm for my sweet middle, and that makes it all the more special. I found this progression of photos to be quite funny! taking a quick rest in their teepee fort on a family hike in our woods. Celebrating my dad's 60th birthday!